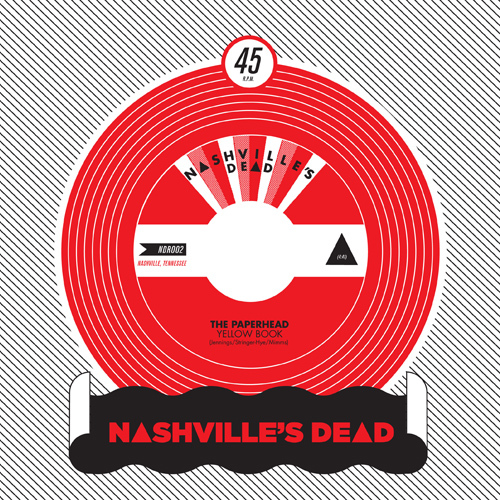 If you couldn’t tell from the images above, we’ll be doing all singles in a custom Nashville’s Dead die cut paper sleeve [kindly designed by our favorite badboy Miles Johnson] And all singles will be pressed at Nashville’s URP in one time runs of 300 on standard black vinyl — so when they’re gone, they’re gone. We’ll have some available through the site, but you’ll also be able to get them in and around town. We hope you are all as excited as we are. It’s been a dream of ours for a long time now to be able to put out records of bands we love. We’ll have more announcements coming soon in regards to future releases — but go ahead and put these two on your “NEED” lists and get stoked. One luv. Congrats! Glad to see so many good people and bands pressing records. Don’t forget about our favorite label!! Infinity Cat!! When will these singles be available to buy? Can we get them online? The Useless Eaters single ought to be out before Christmas and The Paperhead single should be available in mid-January. We’ll have solid release dates soon. And yes, you will be able to order them in our online store. Congratulations on your first release(s)!! I guess I’ll just have to buy whatever you’re selling, when you sell it – as fate demands… ooo-wee-ooooo! There’s always room on my shelf for more good music – bring it on!